We recently completed our streetonomic review of Primerica, which found that most Primerica representatives are not making a full time income. We decided that we'd take a closer look at the Primerica Business Opportunity. If you are looking for more information about the Primerica business opportunity, then it's highly likely that someone has recently invited you to join as a new recruit. We hope that this review will help you decide whether or not the Primerica opportunity is right for you. Primerica doesn't use traditional avenues of marketing and promotions. Instead, they have chosen to sell their services using multi-level marketing. This has helped Primerica become very profitable. At the end of 2016 across USA and Canada, Primerica had close to 117,000 network marketing representatives promoting Primerica within their 'warm markets'. Primerica representatives are paid based on a commission only incentive scheme. In the 2016 Primerica Annual Report, they note that their 'sales force is able to continually access an expanding base of prospective clients without engaging costly media channels'. We have no doubt that this low cost distribution model is good for shareholders, that doesn't make it good for Primerica representatives. Our research found that in 2016, Primerica representatives earned an average of less than $120 per week. To get an idea of how successful Primericans access new prospective clients, we looked at a collection of 'Primerica napkin presentations' produced by an RVP in 'Team Unstoppable'. He explains that at Primerica, they simplify financial services. Making concepts easy to understand is the 'reason we get paid the money we do'. He developed a series of 5 minute stories designed to gain interest. The goal is to introduce yourself, and Primerica, to a new prospect in a way which leaves them ready to book a full appointment. Sharing these strategies with a large team of recruits was a key to his success. It all starts with how you describe your occupation. They suggest you 'bait the hook', and explain that you work for a company that teaches people things financial companies don't want you to know, 'because it would put them out of business'. We don't agree with this tactic, suggesting that you have access to some secret information is not just untrue, it's unethical behavior. If you are about to become a Primerica client, these napkin presentations will give you an idea of what to expect. Just like any financial planner, the services can be summarized into, insurance, debt management, tax planning, and wealth creation. The napkin presentations gave us an idea of the services offered, and how they sold. Their goal is simplify the services offered by Primerica, and to highlight the benefits of a specific service. One presentation explains that a financial plan is like a house. The strong foundation is life insurance, then after that is in place you can focus on debt reduction and wealth creation. It is no surprise that the primary focus is on life insurance, we believe that this pays the best commission to repesentatives. Life insurance, and legal protection, are the only products provided directly by Primerica. 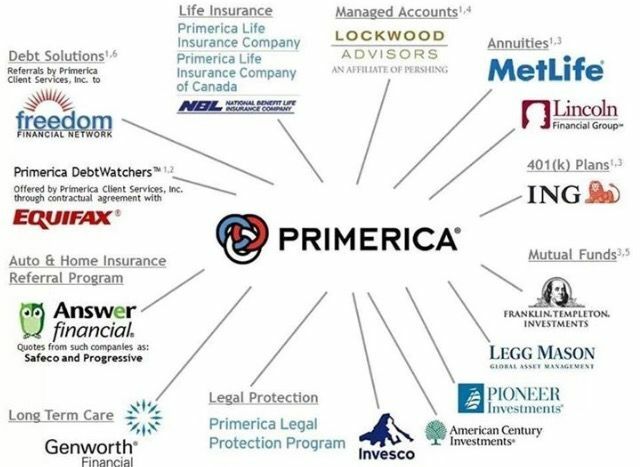 All other Primerica services are through third party providers. The wealth creation strategies covered in the napkin presentations cover both diversification and dollar cost averaging. They will explain that mutual funds are less risky than owning a single stock because you are protected if something goes wrong with that company, this is diversifiction. Dollar cost averaging is done by making regularly monthly investments into your mutual funds. This means that as prices drop, you buy more units (with the same monthly amount). When prices eventually recover, you have lowered your break even cost. We saw something about the Rule of 72, they use this to explain that your money will grow faster if the rate of return is higher. They have a table comparing the difference between investing $1,000 at 3% or at 12% over 66 years. 12% being the historic average return of the stock market since the early 1990's. They suggest that investing in mutual funds can achieve this rate of return in the future. Giving investors this expectation is problematic because we all know that, past performance is not an indicator of future performance. There is nothing new about these strategies, any financial adviser would explain the same concepts. Some financial planners would explain that index funds are even better than mutual funds. Rather than trying to 'game' the market by selecting specific shares, index funds buy the shares in a proportion which copies the index. You won't beat the market with index funds but your investments will always closely match it. Our own research found that most investors underperform the market with mutual funds. Mutual funds are generally more expensive to operate than index funds. They have to employ people to analyse markets and decide when to buy and sell shares. Index funds just buy shares to match the index and hold them. Index funds charge lower fees, which results in better returns for investors. You can save fees, and potentially improve your returns if you invest through index funds instead of mutual funds. Primerica heavily promotes their term life insurance. If you have a whole life policy, they will recommend that you switch to term life, and invest the difference. Buy term and invest the difference, is described by Primerica as the 'cornerstone' of their customer offerings. What they don't explain is that with whole life, you are already investing the difference. This is because these policies have an investment component built into them. The returns you can achieve within a term life policy will depend on which investment options you select. The returns you can achieve with Primerica also depend on which investment options you choose. You might even be able to invest in the exact same mutual funds. Another important point Primerica seems to have overlooked, is that term life becomes more expensive as you get older, where as whole of life does not. Even though term life might look a lot cheaper while you are young, whole life could end up being the cheaper option if you keep the policy in force until retirement. So far we have not been overly impressed with this 'one size fits all' approach to investment advising. There is no such thing as a financial strategy that suits everyone. Your personal circumstances will determine which products work best for you. It is possible that you can improve your finances by paying off your home faster or setting up a Roth IRA, but there is no guarantee that these strategies are best for you. On their website, they describe the Primerica business opportunity, as a chance for people from all backgrounds to make their dreams come true. This vague description along with a collection of success stories is all that is provided on the official website. We found it a bit unusual that they didn't provide more details, but perhaps they want us to meet with a representative to find out more. We were able to find a short presentation of the Primerica business opportunity. This explains Primerica helps middle income families get out of debt and achieve financial independence. Allegedly they are free of corporate influences because they are commission based. For the record they are not unique in this, most independent financial planners are purely commission based. The presentation ends telling us that the business is sustainable because new recruits are being signed on every day, and people will always need insurance. We do not agree with this. The fact that new recruits are signing on every day does not mean that they are all making money. In their income disclosure, Primerica notes that in 2016 representatives earned an average of $6,088. That's a paycheck of less than $510 per month! We read through 86 slides which we believe is a version of the full Primerica business opportunity presentation. The presentation opens by stating that Primerica is both the best part time and the best full time opportunity. You can decide how much time you put into Primerica. Next, we saw something which is very familiar to anyone who has been around network marketing. They explain that if you start with a penny and double it every day, then after a month (on day 31), you'd have over $10 million. This is supposed to encourage people who are just starting out in MLM because they are only earning pennies (if they are turning any profit at all). The theory is that their income will grow exponentially as they recruit and 'leverage' their returns from the work done by their downline. Essentially they are conditioning you to accept failure. When you are not seeing any substantial return on your efforts, they will remind you of the penny which doubles. They'll claim it's better than a job because in the long term it results in millions of dollars. The only problem is that for most people who join MLM, the penny never doubles. Jon Taylor has done extensive research on network marketing, and found that 99.7% of people who join any MLM, will lose money from it. He has provided a list of companies which he has already evaluated. He found that Primerica has raised at least 4/5 red flags. This means that he'd say 'Primerica is a product based pyramid scheme'. He calculates that your chances of making money with Primerica are lower than if you bet the money at the casino, or used it all to buy lottery tickets. The presentation goes on to show some pictures of expensive houses, boats and cars. This is known in mlm as 'dream building'. They show you what life would be like if you had lots of money and more importantly, the time to enjoy it. We are not sure how you'd achieve this lifestyle on an average of $6,088 per year, but then again we don't believe in magic pennies that double every day. I - Investor, you make your money work for you. This is passive income. The secret to becoming a 'wealthy parent', is to develop passive forms of income. These can continue to earn money for you while you work on other things, or just enjoy life. The presentation goes on to claim that business owners have a higher average income, and accumulate wealth faster. We found that there is a ''Primerica Ownership Program', which allows 'qualifying RVPs' the ability to transfer their downline to another Primerica RVP, but only if they 'meet certain criteria'. You will also have to comply with all the terms and conditions and 'various operating policies and procedures issued by Primerica from time to time.' So you might be able to own your downline and trailing commission, but that's only if Primerica allows you to. Our version of a 'business owner', is someone who is in charge of their business. They set the operating policies and procedures, they write their own terms and conditions, and they can sell their business at any time they want. To us it appears that the Primerica business ownership program is designed so that they can decide which RVPs are allowed to transfer their 'business'. The second problem we have with this business ownership claim is in relation to the income and wealth accumulation. Statistical averages aren't a guarantee of results. On average business owners might earn more and become wealthier. This doesn't mean that all businesses succeed, and it definitely doesn't prove that Primerica is a good business opportunity. This could be an honest mistake, or it could be that Primerica is intentionally trying to manipulate the data to make their opportunity look better. The presentation moves on to show us that Primerica is on the New York Stock Exchange NYSE:PRI, and is making lots of money. We already know from the annual report, that part of why they are so successful is because they use MLM. In 2016, Primerica representatives earned an average of $6,088 in commission. By comparison, in 2016 certified financial planners averaged $65,832 annual income. Both opportunities involve selling insurance and investment products for commission. If you were offered the chance to earn 10 times more money for doing a similar job, would you stay at your current job? Primerica is profitable because representatives aren't earning a lot. The presentation then goes through a product sales pitch, similar to what we picked up from the napkin presentations. The gist of it is that Primerica can teach anyone to become protected (buy life insurance), debt free (refinance your mortgage and all other debt with them), and financially independent (buy mutual funds from them with the difference). The presentation then suggests the 'next step' for those who are ready to proceed with the Primerica business opportunity. This is to complete your own FNA (Financial Needs Analysis), and get on your own journey to financial freedom. In other words they try to sell you products as part of the recruitment process. Now you aren't required to buy any products because that would make it an illegal pyramid scheme, but we have no doubt that those who don't buy get less support from their upline. This is something which bothers us with the Primerica process, if you are in training to become an adviser, then why would you buy products from someone else. You should wait until you are licensed, so that you can be your own first customer. Why pay someone else commission when you can earn it for yourself? We then see more standard MLM theories of why network marketing is a better way because you are 'sharing the success', and being 'rewarded for helping others achieve financial freedom'. This flows nicely to the request that create a list of warm leads and start recruiting them right away. We have written a review of Primerica, making money isn't easy! The napkin presentations told us that Primerica 'teaches people things financial companies don't want you to know'. The business opportunity presentation told us that Primerica, 'teaches people how money works'. They both suggest that these teachings can set you on the path to financial freedom. We think we have an idea what they will teach you! We found that Primerica explains how money works with 6 strategies. We are confident that we are in the right place because we see the statement that 'no matter what your income level, you can achieve financial security'. These must be the secrets we were told about in the presentations! We'll look at each of the 6 concepts in detail below. The sooner you start saving, the better off you'll be at retirement. This is not just because you spend more time saving, it's also because of compound investment returns. The longer you leave your funds invested, the more time they have to grow. In order to reach your retirement goal you should start saving now! This is no secret, it's common sense! Primerica will tell you to start investing in mutual funds right away, because the longer you wait, the less likely you are to achieve your retirement goals. This could be a strategy to get you to sign up on the spot. We'd suggest using index funds for even better returns. Before you commit to putting money into any investment opportunity, you need to ask yourself an important question. Can I live without this money? You should not invest at all unless you have enough discretionary income to spare. That's money left over after you've paid your bills and covered other living costs. You should also remember that there is no such thing as a risk free investment. Even if the market did make 12% for several years, there is no guarantee this trend will continue. You should never invest more money than you are willing to lose. This is just another way of telling you to buy mutual funds from Primerica. If you invest just $100 a month for 40 years, you'll have a substantial sum at retirement. It's not all that different to the high cost of waiting. Except this is designed to convince you that you can afford to invest every month (even if it's just a small amount). The concept of compound returns is not a secret. Financial companies want you to know about it, because people who understand this are more likely to invest with them. Mutual funds are an option, but a cheaper option is index funds. Less fees means more money for you. This is a simple way to find out how long it will take for money to double. If you divide the rate of return by 72, you get the number of years it takes for money to double. So if you have a rate of 8%, then your money will double every 9 years. This is another example of something which several financial companies tell their clients. It's a good way to convince people to invest with them! Having said that the rule of 72, is just a short cut used for quick estimates. It is not as accurate as the discounted cashflow analysis used by trained financial professionals. If you invest your money, you will earn interest. If you keep it invested, you will earn more interest. If you have the interest reinvested, then you'll also earn interest on your interest. This is the 'power of compound interest'. Financial institutions all over the world have been telling their clients about this concept for decades. They want to encourage people to leave their funds invested with them. This concept is used to show the benefit of long term investing. Several investment advisers recommend using a buy and hold strategy. This long term strategy, which is sometimes called the 'set and forget' style of investing, uses the power of compound returns. Primerica points out that with compounding, your investment in mutual funds can grow exponentially. What they forget to mention is that investing in equity funds (either mutual funds or index funds), does not give you a constant rate of return. All investments have financial risk. Once again we'd remind you to never invest more than you can afford to go without. Once the highest interest loan is paid off completely, you can direct all that extra money to paying down the next most expensive one, and the process goes on. This is a very good strategy because paying the most expensive loans first saves you the most interest. Primerica has a service called 'debt watchers', which we assume charges an ongoing fee to help you implement this strategy. This is definitely a strategy that can help you get out of debt, but there is no reason to pay for it. If you look at your statements, you will see how much interest each loan is charging. You can set up this strategy on your own and save yourself the fees. If you are looking for ways to manage your debts, then you might like our 6 tips for paying off credit cards, which we wrote a couple of years ago. This is another concept we have seen before, and which is commonly shared with clients by several financial institutions. It's a simple diagram which shows that as you get older, your need for life insurance decreases. The reason for this is because life insurance is designed to replace the money you would have earned from now until retirement. It's to help your surviving family maintain their financial standard of living. If you look at the amount of money you will earn between now and retirement, this amount will decrease for every year you don't die. Another reason for the reduction in the need for insurance, is your children will grow up. Hopefully they will start earning their own money. When this happens, your need for insurance decreases because you are no longer considering the need to look after them. Your expenses will decrease as you get out debt and your children leave home. This theory is used by Primerica (and many other providers) to highlight the benefits of term life insurance. If you are relatively young (under 45), then it's quite likely that term life will be substantially cheaper than whole of life. Replacing whole of life with term life and investing the difference is the 'cornerstone' of what Primerica does. This does not meant that it's right for everyone. Even if the strategy is right for you, this does not mean that Primerica will offer the best insurance for you. Primerica will only sell their own term life insurance. Before you sign up for a policy with them, we recommend that you do some research to make sure that term life is best for you. If you are looking for term life, then we found a company called 'Trusted Choice', which offers free online term life quotes. It's a good idea to use a service like this before deciding which insurance provider is best for you. All in all, you can learn some useful facts about money from Primerica. However you don't have to join Primerica to learn about money. With a simple Google search, you could learn all this and more. Indeed has a long list of mostly positive reviews from current and former Primerica representatives. We found it interesting that Primerica representatives don't talk about what they have learned about finance. Instead there is a lot of talk about 'finding people, hiring people, and using their connections to make sales'. One current representative mentioned how much he was learning about telemarketing and recruiting. One of the former members notes that ' I provided a lot of clients for the lady I worked for but never made any money'. Sounds like she used up all her warm leads before she was licensed. Remember you don't have to provide leads, if providing leads was a requirement of the job, then it would be an illegal pyramid scheme! What we learned from reading through these reviews, is that there are a lot of people who are willing to say nice things about Primerica. It happens that they are also the people who are trying their best to recruit as many new members as possible. . It is possible to make money with the Primerica business opportunity, however we believe it is highly unlikely. We have noticed an undeniable pattern of recruits having their warm markets completely depleted before they are licensed. This is not how a nurturing company would treat new recruits. If they cared about helping you become financially free, they'd pay the recruits a commission for the warm leads they provide. Alternately, they'd tell the recruits to focus on learning while they are getting their license, and to start calling their warm market when they are ready to make money. The fact that more than 80% of recruits quit before becoming licensed should be an early warning for anyone considering this opportunity. As always this review is made up of the opinions we have gained from our own experience and the information we could find online. We'd love to hear your opinions in the comments section below. Let us know what you think, about the Primerica business opportunity.